Recently Disney delivered a mother lode of mostly animated classics on Blu-ray, ranging from the 1941 The Reluctant Dragon (live-action/animation combo) to the 2004 Mickey, Donald, Goofy: The Three Musketeers. The good news for consumers is that there are actually only four separate Blu-rays to purchase in order to collect them all, thanks to the super-bargain, triple-feature that includes Dragon (perversely relegated to “bonus feature” status) with Fun and Fancy Free and The Adventures of Ichabod and Mr. Toad (1949) on the same disc. There’s also Disney Renaissance features Hercules (1997) and Tarzan (1999). We’ll take a look at all of them. 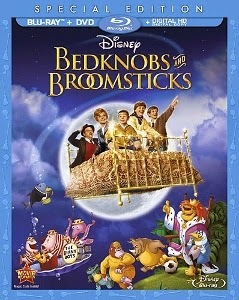 Leading the pack with ease is the 1971 live-action/animated spectacular Bedknobs and Broomsticks. Working a general formula meant to mimic the blockbuster success of Mary Poppins, Bedknobs wasn’t the box office sensation it was intended to be. But this surprisingly edgy (for Disney family fare, that is) fantasy is rooted in a historically important chapter of World War II, as the Nazis seemingly unstoppable Blitz trudged forward into Great Britain. 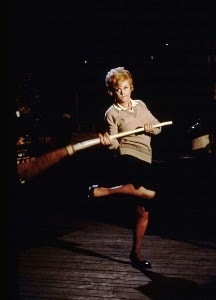 A witch-in-training, Ms. Price (note-perfect Angela Lansbury) must care for a trio of lovable orphans (no sarcasm intended; Ian Weighill, Cindy O’Callaghan, and Roy Snart are charming and funny) while seeking the missing text to a spell that will allow her to instigate the “substitutiary locomotion” needed to bring down the invading army. 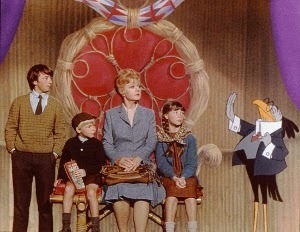 They’re aided by con man-turned-surrogate father (to the orphans), Mr. Browne (Poppins co-star David Tomlinson). 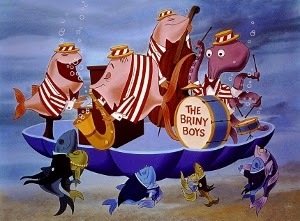 The animated sequences involving an underwater world and a fast & furious football match are decidedly old school, which is absolutely welcome for anyone weary of modern-day, digital “perfection.” The brothers Sherman, Richard M. and Robert B., deliver the good yet again with more Oscar-nominated music. While none of the individual songs matches the iconic status of their Mary Poppins classics, “The Age of Not Believing,” “The Beautiful Briny,” and “Substitutiary Locomotion” are cleverly crafted delights. The musical set pieces are well-choreographed and if the entire affair seems a bit indulgent in length, it’s so packed with fun moments that it manages to justify its 117-minute running time. Disney buffs will note this is NOT the 139-minute restoration issued on DVD in 1996. Somewhere along the line, Disney made the (in my opinion) correct decision to present the original theatrical version instead of the far-from-perfect restoration. The material included in the restoration was incomplete, containing in some cases still-images in place of missing shots and even substitute actors doing ADR for unavailable original cast members. The compromise that should hopefully please most fans is the inclusion of the extended and deleted scenes and musical sequences in sterling high definition. That’s about a half hour of extra material, which highlights the bonus section. There are several standard definition featurettes ported from the old DVD, including one that illuminates the process behind creating the “roadshow” restoration. The originally grainy, gritty 1971 visual look is retained in Disney’s outstanding 1080p transfer. And the music sounds terrific in the new DTS-HD MA 5.1 lossless mix. The Blu-ray package includes a feature-free standard DVD (the 117-minute theatrical cut) and a digital copy. Essential viewing, not only for nostalgia buffs but also for a whole new generation kids yet to be introduced to Ms. Price’s magic.